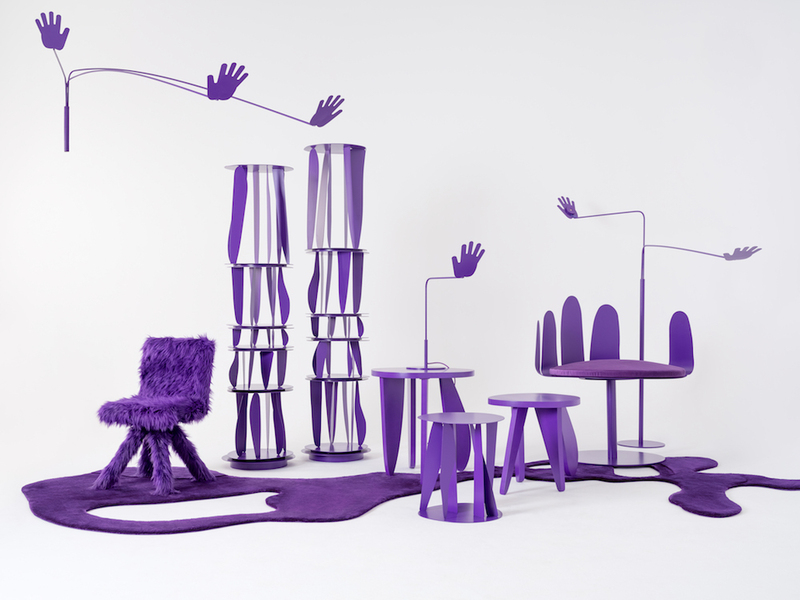 Harry Nuriev of Crosby Studios unveiled a whimsical, Dr. Seuss-eque collection of neon purple furniture for NYCxDESIGN. The maximal collaboration with the New York-based clothier, Opening Ceremony, includes interior wares and fashion items including lamps, garment racks, side tables, and accent chairs— as well as a set of brush-stroked vases and tote bags. AN spoke to the Moscow-born designer about his vibrant use of color, anatomical references (specifically the hand), his design process, and future aspirations. Architect’s Newspaper: What is the inspiration/idea behind the collection? How does that translate cohesively through apparel, ceramics, and, and the home good? 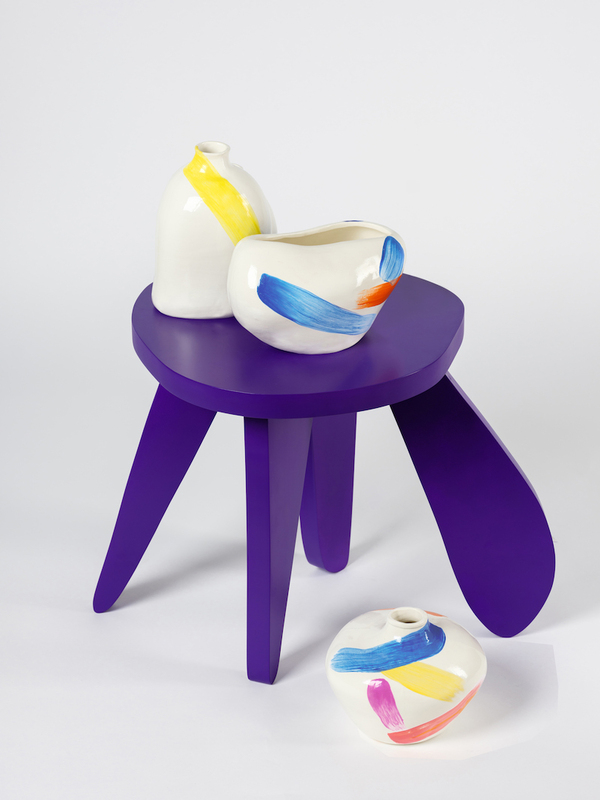 Harry Nuriev: I was inspired by the idea of making furniture a part of your everyday wardrobe. Furniture can be equally as expressive as one’s outfit, and I hope I achieved that with this collection. I wanted to make the collection cohesive through the use of figurative abstraction, abstract expressionist brushstrokes, and playful materials, forms, and colors. Another inspiration behind the collection: I’ve always been obsessed with Pedro Friedberg’s hand chair. I think it’s ingenious to support the body by a giant hand—it gives you a sense of security, as if some giant being is protecting you. The play in scale is also ridiculous, which is what inherently drew me to the chair. AN: How did the collaboration begin? What was the goal? HN: This is the first time I’ve worked with OC, but I’ve been a fan of the brand since its inception. It feels like a very organic collaboration that comes out of a place of mutual interest and respect. Once we met, everything was very seamless—so much so that our micro-home collection grew to encompass not only chairs, but bookshelves, ceramics, rugs, and even T-shirts, tote bags, and keychains. 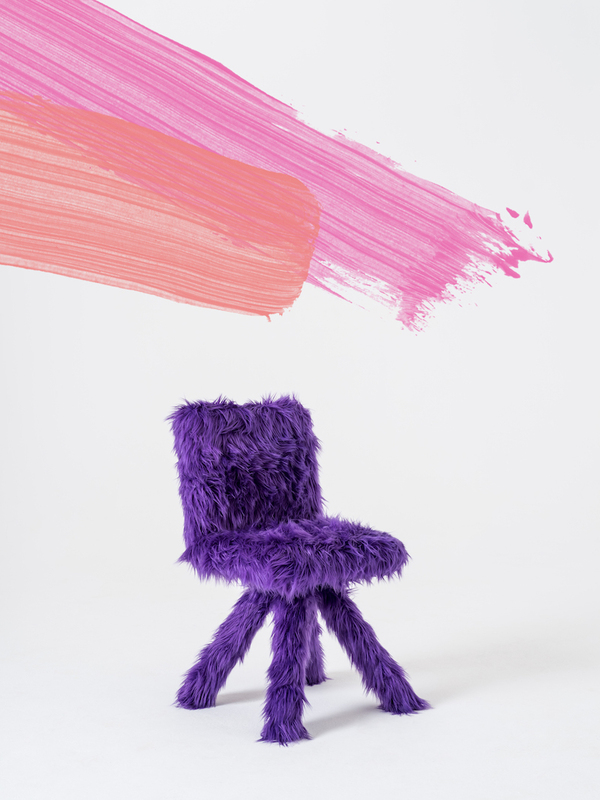 The typical four-legged chair is swathed in neon purple faux fur, transcending it from every day to a surrealistic abstraction (Courtesy Crosby Studios). AN: What brands are you vying to work with in the future? HN: Rimova, Vipp, NARS, and Opening Ceremony one more time, but in their LA flagship. I’d also love to work on a Celine store, adding new ingredients while preserving the heritage of the brand and making Hedi Slimane happy at same time. AN: How do you plan your year? What is our product development process? HN: I’m about to make a new line of furniture—it’s going to be really special and new for me. I’m hoping to complete a lot of projects over the summer, but my schedule is always in flux—I feel like I’m constantly traveling the world, and starting new collaborations each month! I’m also opening a pop-up gallery in New York in September, and hope to bring it to LA as well. Visiting Japan is definitely on the horizon. AN: What product do you wish you designed? HN: I’d love to work with more fashion brands, design movie sets, and even work with cosmetic brands… I really like the idea making the perfect nail polish and crazy lipstick with my own elusive palette. 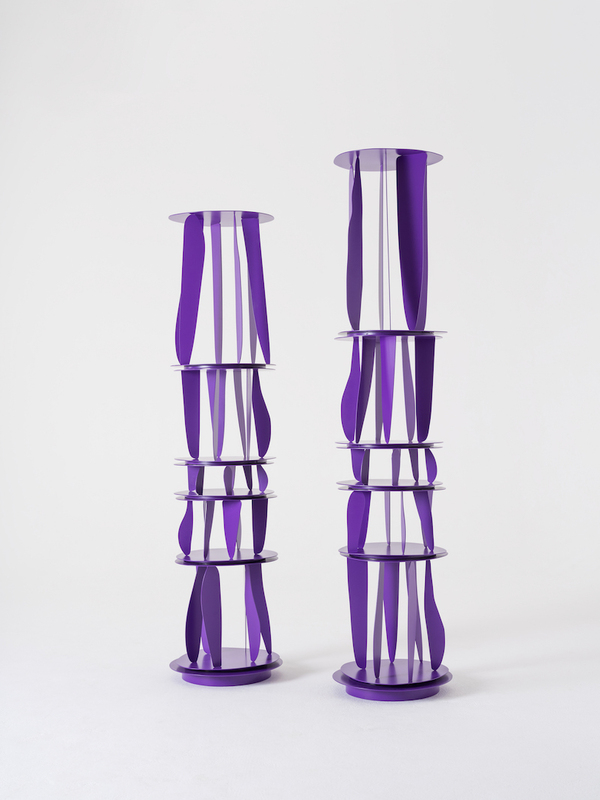 These towers shelf rotate on each level, twisting and twirling visual conjugations of bent metal abstractions. (Courtesy Crosby Studios). 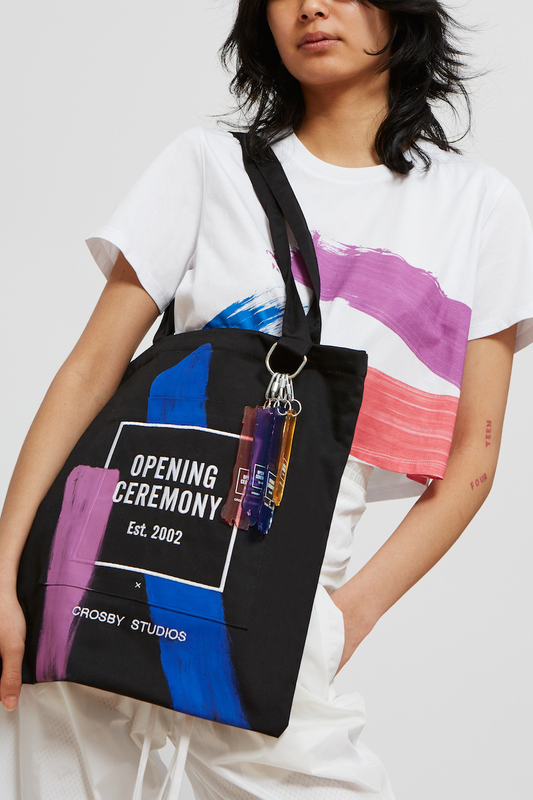 Including a tote bag and a cropped tee shirt, the fashion accessories are adorned with the brushed paint stroke that appears throughout the collection (Courtesy Crosby Studios). AN: What are you working on now/next? HN: I’m working on a new collection of furniture and some nice commercial spaces in US and in Europe. I also have a collaboration with Liam Gillick for Sight Unseen OFFSITE’s Field Studies series, on view May 17th! The limited edition pieces are sold at the Opening Ceremony Howard Street flagship store and available in 2-10 items per unit, ranging from $35-$230.